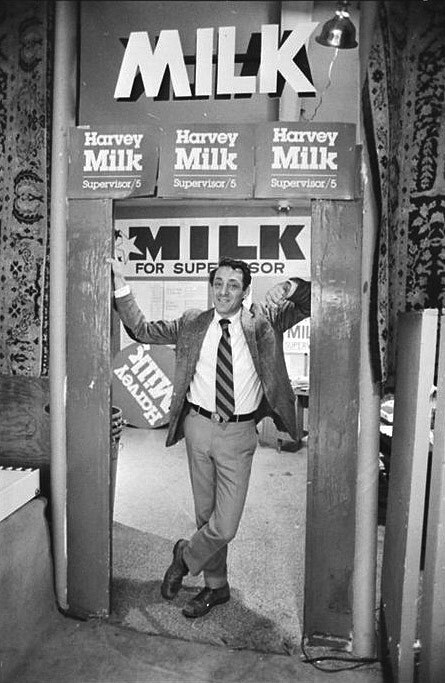 Harvey Milk, Nov. 23, 1977, after successful Supervisor campaign. Harvey Milk was more than just the first openly gay man elected to public office in California. He was an embodiment of a movement. His approachable demeanor paired with his empowering words of wisdom led Milk to gain supporters of all kinds, especially those who never felt like they had a voice before. Starting off as a small businessman working at his camera store in the Castro, Milk became involved in his neighborhood politics, and soon decided that his passions and ideas were too important not to share. Milk ran for office three times before he finally won a spot on the San Francisco Board of Supervisors in 1977. He made a large impact on the city even though he was only in office for 11 months before he was assassinated. However, Milk’s legacy did not die with him; he is still very important to the LGBT community today. 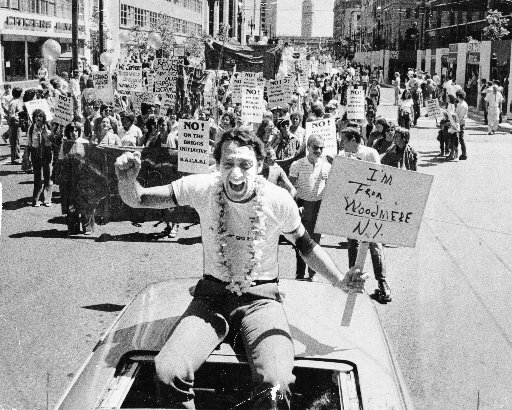 Harvey Milk in the 1978 Gay Pride Parade. This is an image of Milk at the Gay Pride Parade in San Francisco in 1978, the year he was murdered. Milk knew that an assassination was possible, but he did not let this threat silence him. Usually people with political power, especially after the Kennedy Assassination in 1963, were more protected at large public gatherings, however, Milk can be seen in this photograph sitting on the roof of a car, one with the people. He is dressed like the crowd behind him, he is holding a sign just like many of the people behind him, and he has joined in marching down Castro St. for a common cause, the right to be gay. Harvey Milk did not change who he was so that he could become a part of San Francisco politics, he took advantage of the fact that he was different and promised to give the minority groups and LGBT community a voice. The main battle Milk fought during his short time in office was against Prop. 6. This proposition was called the Briggs Initiative because it was sponsored by John Briggs who was a state legislator from Orange County. The goal of this proposition was to repel gay rights in areas of California including San Francisco. If passed, it would have banned gays and lesbians, and possibly anyone that supported gay rights, from being able to work in California’s public schools. 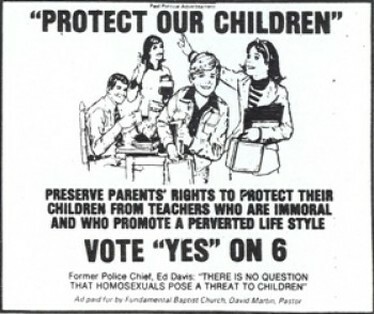 Below is a poster-sized ad in support of the proposition that claims all gays and lesbians live an “immoral and perverted lifestyle” and that parents should support this initiative to protect their children. One of the main supporters of this movement was Dan White, a fellow member on the Board of Supervisors with Harvey Milk. Milk, openly being gay and holding power, fought hard against this proposition because it knew that being gay or lesbian did not affect how men and women were able to do their jobs. White was very against anything that had to do with gay rights and this started to show in regards to this initiative and began his heated relationship with Milk. Dan White was a large supporter of the Prop. 6. He stepped down from his position on the Board of Supervisors after Prop. 6 was defeated because he was extremely homophobic and could not support gays and lesbians being able to work in the public school system. Tensions got even higher when White then asked for his position back on the board after realizing that his quick step down left a major hole on the board that needed to be filled and could potentially be filled with a gay sympathizer. Sadly, on November 27th 1978, Harvey Milk’s worst fear was realized. He was assassinated in city hall along with Mayor Moscone. The night after his assassination 40,000 walked through the streets and held candlelight vigils. There was no violence and barely any talking, just 40,000 people coming together under a common cause and mourning the death of a man that meant so much to them and their community. The Castro felt this devastating loss of their gay leader more than any other district, but the people of the Castro took Milk’s advice and did not let this tragic event silence them or keep them in the closet. Even now Harvey Milk is seen as one of the most inspiring gay activists in history and his quotes still power the movement today. “Dan White Biography.” Bio.com. Accessed November 10, 2016. Milk, Harvey. “Harvey Milk’s Last Words.” Speech, Played after His Assassination, San Francisco. The Times of Harvey Milk. Directed by Rob Epstein. United States, 1984.